Yes, this is possible on the Phorus PS5 Speaker, and PR5 Receiver products. 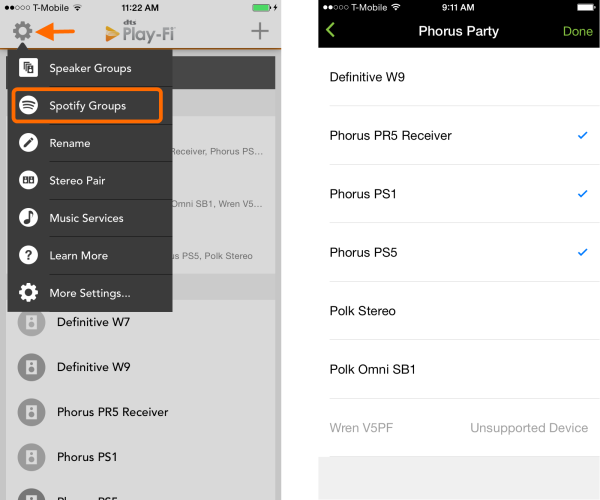 To do so, you must first create a Spotify Group within the Play-Fi app. Spotify Groups are different from normal Play-Fi groups in that they specifically group speakers together for viewing within the Spotify app. This is so that normal grouping and zoning functions remain modular within the Play-Fi streaming system. From the Play-Fi Control screen of the Play-Fi app (left), tap the Settings button to open the pop-up menu, and select Spotify Groups, which we’ve circled here. This option allows you to edit or create Spotify Groups. 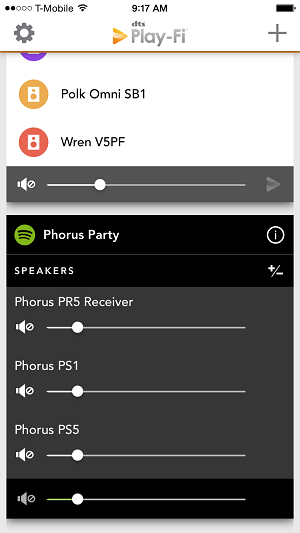 After you've elected to create a new group and given it a name (we called ours "Phorus Party" in the example) you can then pick from any of your Play-Fi products to be added to this group (right). Any speakers that can't be joined in a Spotify Group will be greyed out. Once you’re satisfied, head to the Spotify app to start streaming. If you want control the volume of individual Play-Fi products within the Spotify Group after you’ve started your stream, head back to the Play-Fi app, and your Spotify Group will automatically populate a module on the Play-Fi Control screen. It's important to note that this functionality is not available on older generation Phorus products such as most Phorus PS1 Speakers (very few revisioned models have this capability) or any PR1 Receivers.